I always remember dreading to teach conditionals, inverses, converse and contrapositives. Last year at a KLN meeting – a colleage, Susan, shared a lesson – she and her department had developed after training with Quality Core last year. Since I’m now teaching geometry again, I decided it was a great time to try it out! It was a beautiful lesson. However, with students who struggle with reading, I definitely see myself modifying just a bit. Students were confused in the beginning – but after talking about the choices, taking time to do a sort with a partner / small group and talking about the different statements – each one can successfully identify and/or write each statement. This lesson includes reading, speaking, students get up and move, discussion, small group card sorts (inverse, converse, contrapositive), practice assignment also asks students to create their on set of statements (writing). Simple. So effective. Thanks to Susan for sharing this with me! Trim around the edges, then use a blade knife to oh so carefully cut a slit to open the pocket. It worked! Now with the laminated ones – I can write target concepts that are included in the pocket for practice/remediation then I can erase if I need to switch out items as units progress. When I decided INBs were a go for the school year, I loved @mgolding’s idea for storing copies & handouts in the hanging vertical file. Earlier in the summer, @druinok had mentioned Mardel online for some great finds. Someone else had tweeted – they had the Filetastics on sale for $5! I put them in my cart – logged in the next morning and they were no longer on sale. 😦 $12.99 now. Oh, well. Missed a great sale, they could wait. When I was moved to my new classroom – there is no space. I had to order the filetastics – $12.99 or not. I visited their site, picked a green, red and black one – put them in the cart, went to check out & I got them for $5!!! woo-hoo! Somebody loves me! I was a little leary when I first opened them up. But once I got them hanging – with a file folder in each pocket – they are VERY sturdy. Perfect. I felt this was a good way to use the space on the unused/extra door in my classroom. I started with all gray folders to match. I added my class colors in the bottom pockets – so I can place items/info for absent students – quizzes etc. I’ve passed back. I had a couple of packs of cute-mismatched file folders from Walmart – put them in to see how they looked (green side). I think I like them – got to get back there soon to see if I can find more – so they can at least be coordinated. On the shelf against this wall – I followed @mgolding’s lead again – labeling where items need to be returned. Only 2 weeks in to the year – but so far, its made a huge difference. Simple. Effective. Some great thoughts in their ads – if you haven’t seen / read them – its worth a look. Yes, I know its Saturday – but I crashed before 8 last night and slept a solid 10 hours. With football season underway (Go Lakers! 2-0, woohoo!) and Marching Band out for their first performance today, that means one thing – cool fall days are not too far away! Which means soup weather! Our family is not soup fans when its hot outside. This is actually my SILs recipe – but it truly is my very favorite! Its best made a day or two early, so the flavors can meld. I have even frozen leftovers and they turned out just yummy! In large pot, cover chicken with water and cook until done – about 15 minutes (reserve 4 cups of stock for soup). Set aside to cool. In large pot heat chiles, onions & garlic. Add all ingredients (except chicken). Heat to boiling, reduce heat to medium and simmer 45 minutes-1 hour. Meanwhile, shred chicken and add to soup. Serve with tortilla chips as crackers, garnish with shredded cheese, sour cream, cilantro or diced avocado. Refrigerate or freeze leftovers. 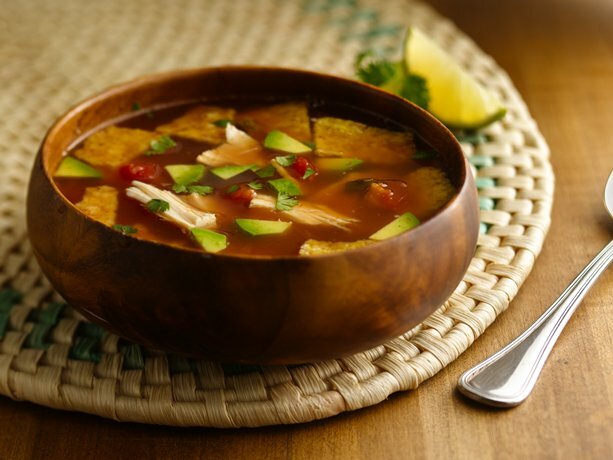 If you are a black bean or corn fan in your soups – add ’em! For a great gift – use dried minced onions, garlic powder, bouillon cubes and create a spice packet of needed ingredients in small ziploc bag. Attach cooking directions to gift bag containing canned chicken, chicken stock, and remaining ingredients. I think worcestershire is the only thing not able to include in soup-gift pack. I would *LOVE* a gift like this! So the pictures I thought I took for my Monday post were somehow not on my phone. Clueless. So, I’ll share a quick and easy activity I snagged from Everybody is a Genius blog. I created 8 different sketches (here blind draw). Students were asked to describe to their partners – using geometric terms – and their partners were to recreate the sketch without actually seeing it. Listening to them describe, you can easily assess whether they know the correct terminology or not. Nothing cute and crafty this week but a quick and fun way for students to practice using their vocabulary! Per request of Math Tales from the Spring – a quick bit on the Getting to Know You Venn Diagram. This one – I loved – from Lesson Plan SOS using hula hoops! Very simple. Could even be used as an intro to your unit which includes sets / intersections, unions, etc. It could easily be modified for whatever your purpose! If MATH were a food, what would it be? Explain. If MATH were weather, how would you describe it? The BEST teacher I ever had was …. because … (this does not have to be a math teacher, even a school teacher – just anyone that has taught you something). 3 things I expect fof my teacher. 3 goals: one for this class; one for high school; one for life. You can learn a lot about student attitudes toward math based on the first 3 questions. Often times they will share something funny for Q4 – or a time they made a really good grade. Question 5 allows you to see something they may value outside of math class – if they happen to share a teachers name in my district, I will try to send that teacher a message, letting them know…we all need to hear the things we’ve done that stick with our students. Students really do just want a teacher who enjoys teaching, who tries to make learning purposeful and engaging for their students and is willing to help them – allowing them to ask questions when needed. It amazes me they say not to sit behind my desk – seriously, that breaks my heart – because they’ve had that experience in a classroom. 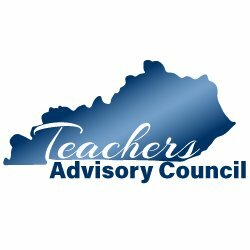 One student told me last year – she had not asked a question since 2nd grade because her teacher had yelled at her when she asked for help. So.Very.Sad. 7 years of not being engaged in math class. I believe goal setting is important. 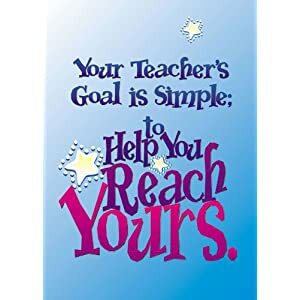 I want to know those goals #1 so I can help students work toward them, but also so I can use them to find connections in my lessons. Since I have had about 80% of my students in class before, I have been looking for other activities to use this year. A colleague shared a venn-diagram activity and I saw someone else blog about it as well – I like the idea, but I hate to use the same idea if another teacher in my building is/will be using it also. With little time to plan, I jumped right in to a set of station activities for my semester – block Geometry classes! My first run was with the parallel lines / transversals stations (I know its a bit out of order, but it will be okay!). I instructed students to take out one sheet of graph paper and we folded them in half, labeling Station 1 & 2 sections on one side and Station 3 & 4 sections on the back side. Students were in groups of 3 or 4. I know the big idea is to move around to the various stations – but my new room is too small :(. Rather than running a ton of copies, I made 3 complete sets of the statin instructions and placed them into page protectors. Students completed their work on the graph paper. When complete, they would exchange their station instructions for another station set located in front of the room. This way students do not have to wait on other groups to complete before moving on. Using a different color for each station, I highlighted the station # and any Words Worth Knowing (thanks everybody is a genius blog!). Two of the lessons called for spaghetti, I used toothpicks. Each student will also need protractors. The stations are not dependent on one another, so order of completion did not matter. The discussions were great because students’ angle measures were not equal to their group members’ but the same “patterns” occurred. I probably like the discussion questions component of the activities best. Each student responds to a given set of questions in writing. Then they must pair up with someone who was not in their original group to discuss their responses. Simple misconceptions are quickly cleared up during this time. The layout of this lesson allows students to talk about and look for patterns during the station groups. They process their new information as they write responses and allowed to share verbally again with a partner. Finally, as a whole class we debrief the entire lesson(s). This format really supports the literacy strategies discussed this summer in our twitter book chat #lit4math. I like that no prior knowledge was required for students to successfully learn about transversals and the special angle relationships formed when parallel lines are present. 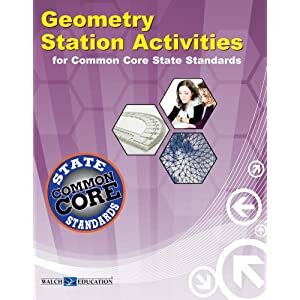 I have compared the listed CCSS for Geometry Station Activities to the suggested Geometry standards of Appendix A and this book addressed over 75% of those standards. Only the measurement and any probability suggested for Geometry are not included in this book. There are 16 station sets and I have my students for 18 weeks…my thought is to use at least one per week, as appropriate… I’ll share more as we get in to the semester. But for this first run, I say 2 thumbs up. *Station 4 deals with corresponding angles – and I reworded Question #1, because it was misleading. Anytime you use investigations, you should definitely go through the entire lesson / activity before presenting it to your students. (duh?) I see this happen too often, teachers just pull out an activity and pass out to students with little/no knowledge of what students will expect / questions they will ask. The book also gives a list of possible student misconceptions to watch for. If your students are not used to this layout of lesson – it may take a little more time to get them through it. Once students got a feel for it, the last stations went more smoothly and quickly. I hope to hear more from others who are using station style lessons. @tbanks06 also shared some experiences with stations for #myfavfriday and said its the best $40 you’ll spend this year! Shop around – I found all 3 of my station books for under $85 total. Got to give a little shout out to HoppeNinjaMath – welcome her to math teacher blogging! I began working on creating cards for the activities needed in this book: . I typed the “index cards” needed for several of the lessons. Feel free to borrow/tweak and use in your classroom – and share – please, just don’t sell “my cards.” You can find the card sets I completed here. I am now teaching Algebra 2 and Geometry, so the Algebra I project is not going to get completed anytime soon. Sorry. Looking over my rosters – most students are not fans of math – so I thought it might be appropriate to “play” the SURVIVAL GAME. The best I can tell – none of these students were in classes where I’ve used this activity. Survival Game was shared with me by a friend who used it as part of her NBCT process and she found it in Mathematics Teacher, February 2002. The scenario is (you can change it of course) – students have been in a devastating bus crash – they are all rushed to the local hospital for medical treatment. Due to low blood supply, there is a call for blood donors. The students chance of survival is based on the probability of a match or compatible blood type being donated. Though parts of this set-up are not realistic – its a great learning task and gets the idea of theoretical vs. experimental probability across. I use white poker chips with color-coded circle labels in the centers – according to % of blood types in the U.S. in 2002. I’ll admit, I am too lazy to change the chips. You go around the room and each student draws a chip to determine their blood type. Discussion comes up – do we replace? Why/Why not? Then we look at which blood types are compatible – a very brief discussion about Rh factors, etc. Resources are linked on the files. Students mark on their recording sheets M-match, C-compatible, N-nonmatch. We begin the simulation of blood donors, recording the data and writing the P(S) – probability of survival as the ratio of (Matches+Compatible) / (trial #). When all 25 trials are complete (its fun – students cheer with matches and groan with non-matches), students compute equivalent decimal values – these are then used to create a graph of their P(S). I love this activity – only twice in all the times I’ve used it have the Theoretical / Experimental Probabilities not “leveled out” within the 25 trials. A discussion about “the law of large numbers” takes place – on how more trials will usually result closer to the theoretical. My first day in geometry – I’m playing the chaos game. I am making Chaos Game template copies on transparencies for each student to have their own triangle. I will let them use dry-erase so the triangles can be cleaned off, filed and reused. Everyone picks a random point (seed) inside their triangle. They roll a # cube, if its 1 or 2, they measure the distance between their point and vertex marked 1,2. Place a new point at the half-way mark. They roll again, measure distance between newest point and corresponding vertex. Place new point half-way between. Continue about 100 times per student (or as many times as time will allow). Overlay the triangles… and you get something close to Sierpinski’s Triangle. Hopefully. I have gotten one each time I’ve played this with students in the past – but you never know because nothing is really predictable. Or is it? I will then give them a section of Triangle Graph Paper and let them “color” a sierpinski trianlge – probably about 3 or 4 iterations. Find as many patterns / geometry terms within our Triangle. What is Pascal’s Triangle and how is it related to Sierspinski’s? I’m thinking I can use this over and over – in probability – similar triangles, midsegments, etc. throughout the semester. Hoping so anyway. These are 2 activities I love – they are somewhat fun, but still bring some good math related discussions. I figure if I share something I enjoy – it’ll be a good transition to a new year. 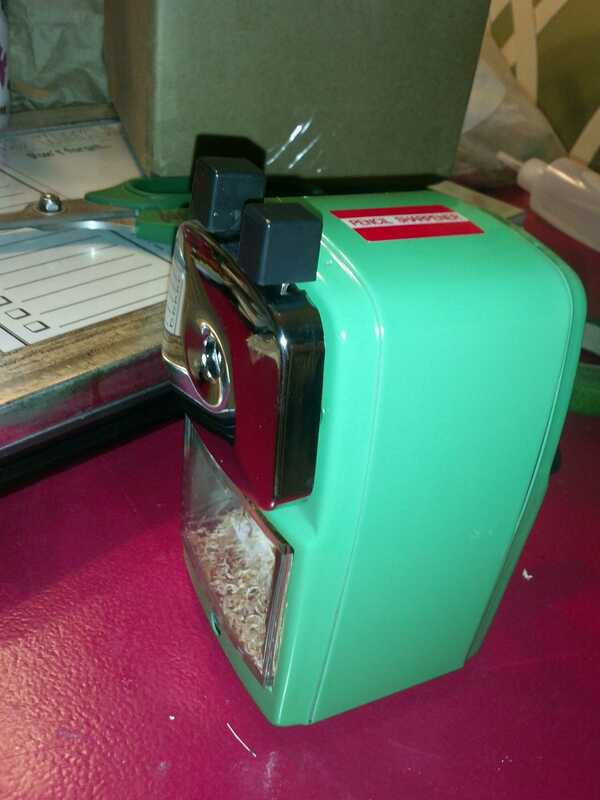 My New Groovy Green Pencil Sharpener! I’ll begin with my new Pencil Sharpener. Like many of you, I read on several elementary blogs just how amazing this pencil sharpener is. Yea, right. So I checked it out. Read some more reviews. So, what do you do with a new pencil sharpener? 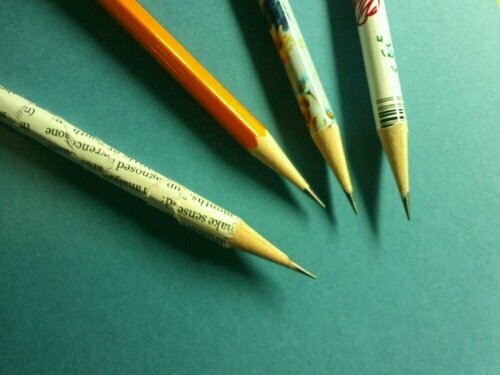 You sharpen pencils. And more pencils. And more pencils. I let me 8 year old sharpen pencils just to test it out. Her first reponse, “Man, ____ needs this one!” She sat for 15 minutes sharpening pencils, and said it was fun! When I asked her what she thought about the Classroom Friendly Supplies sharpener – she yelled, flexing her muscles…”IT’S AWESOME!! !” I have to agree. Sharpeners are always the nightmare in my classroom – going through multiple ones each year. It says its the quietest – well, its not silent, nor should anyone expect it to be. But using the strategy demonstrated in the video, you’ll hear it is much quieter than most. I used several different pencils I have around the house to test run. The first two pencils are Dixon Ticonderoga’s – the first one has had magazine print glued to it for decoration. The last two are from a $1/12 pk – which usually do not sharpen well at all – I hate having them in my classroom. Most sharpeners eat them right up, but not today! You can see all are SMOOTH, steady points – none ready to break when you write with them. I will post again about my Groovy Green Sharpener after the year progresses to let you know how well it stands up to Geometry & Algebra 2 students! But for now, I’m seriously thinking of ordering another one just for home use! Yes, I’m a self-proclaimed nerd when it comes to awesome office/school supplies! This is definitely worth checking out!